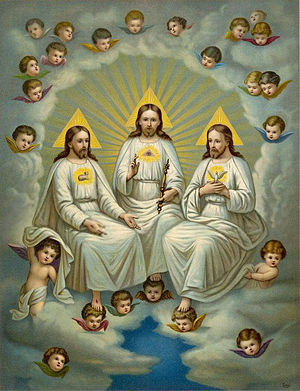 This past Sunday was the festival of the Holy Trinity. Rather than preach a sermon on doctrine and Trinity and such, I chose to highlight a few ways in which we are connected together as brothers and sisters in Christ through the Holy Trinity.The bulk of which was this video with Bishop Mark Hanson, presiding bishop of the Evangelical Lutheran Church in America, that was presented last Friday during the Western North Dakota Synod Assembly in Minot, ND. It’s a beautiful piece that lifts our connection to God’s grace in mission in a beautiful way. Take 10 minutes out of your day and watch the video. I think you’ll be happy that you did! This entry was posted on Tuesday, June 5th, 2012 at 9:20 pm	and tagged with Holy Trinity, Trinity and posted in Recent Sermons. You can follow any responses to this entry through the RSS 2.0 feed.